Oooooh, I love mani swaps! I love looking through someone else's art and choosing something that I love so I can recreate it. And seeing what others choose of mine? Psh, LOVE! Yeah, I'm a mushy, squishy, unicorns and rainbows kind of person. Most of the time. Ha! Anyways. Back to nails. I've done a handful of these mani swaps in the past, and I'm hoping I'll get around to posting them on my "past mani's" page. Maybe I'll just make one big love fest post and have them all in one place, who knows! The March swap is the focus of this post, so I need to stop with the tangents. 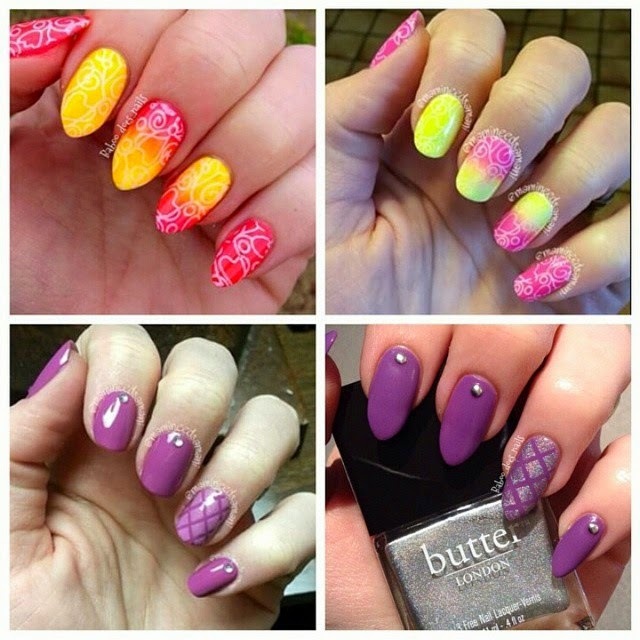 I was paired with @baboo_does_nails this time, and MAN did I love looking through everything she has on IG. I think I picked out about 10 manis that I want to recreate, but I opted for this one because it just screams summer, and I can't wait until warmer open-all-the-doors-and-windows weather! For this mani, I used L.A. Colors Flicker and Absolute. It's stamped with Sally Hansen White On using my Cici&Sisi plate 05. I love it! And here is the collage with both of our recreations. She chose my quilted mani, and totally rocked it! Go check her out! Do you enjoy mani swaps? What's your favorite design to recreate?